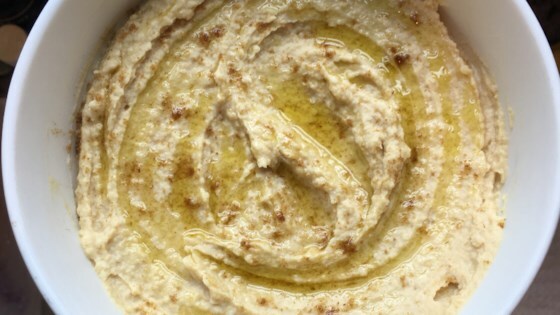 "This hummus is a family recipe passed down from many generations. Eat with warm pita bread." In a blender, chop the garlic. Pour garbanzo beans into the blender, reserving about a tablespoon for garnish. Add reserved liquid, lemon juice, tahini, and salt to the blender. Blend until creamy and well mixed. This bean dip is healthy and delicious--and so easy to make.